Many fishes on our shores can bite and sting. Don't touch them! There are lots of fishes on our shores, but they may be well camouflaged or hidden. Look for them! Not all fishes can be eaten safely. Where seen? Fishes can be found on all our shores. In fact, a wide variety is often seen. However, they are sometimes hard to spot. Some may be very small. Others well camouflaged or hidden. What are fishes? Fishes are vertebrates like you and me, i.e., they have a backbone and internal skeleton. Fishes are the oldest of the living vertebrates and the most abundant in number of species and individuals among the vertebrates. There are about 15,000 species of marine fishes. Fish features: Most fishes are covered in scales. Scales, however, may be tiny as in filefishes. Some fishes lack scales, such as the eel-tail catfishes and moray eels. In addition, many fishes are also coated with mucus to protect against bacteria and other unpleasant substances in the water. 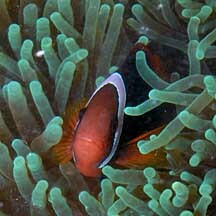 The mucus of the clown anemonefish is believed to be important in allowing it to live among the stinging tentacles of an anemone. Most fishes have a swim-bladder, a gas-filled organ, that helps them stay afloat. But fishes that live on the sea bottom sometimes lack these, such as the gobies. Fishes breathe with gills; feathery red structures filled with blood which absorbs the oxygen in the water. 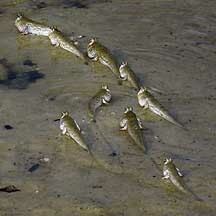 Even mudskippers breathe with gills, keeping a reservoir of water in their gill chambers when they are out of water. Fishy senses: Most fishes have good eyesight. Eyes may not always be on both sides of the head like in the typical fish that we eat. Gobies that stay on the sea bottom have eyes at the top their heads to keep a look out for danger from above. While in flatfishes, the eyes have moved to one side of the body! Fishes have ears and can hear underwater. Many fishes even produce sounds, using their swim bladder to amplify the sound. Toadfishes got their common name because they croak loudly. Fishes also sense sound and vibrations through special sense organs arranged in a line along the sides of their bodies, called the lateral line. Fishes have a keen sense of smell and taste. In most fishes, smell organs are located at the snout. Taste sensors are located in the mouth as well as lips or on 'whiskers' (barbels) such as those in the eel-tail catfishes. In others these sensors are on the fins or scattered over the body. Many fishes are also sensitive to electrical fields produced by their prey. Some can even generate electrical currents, like the electric ray. Swimming along: Long fishes swim by undulating their long bodies in a snake-like manner. Eels and eel-shaped fishes do this. Typical fish-shaped ones swim by flexing their tail and the back end of their bodies. Some fishes like seahorses can't move very fast and only uses their fins to stabilise themselves. Don't eat me! Many fishes are poisonous. Some are merely unpleasant tasting, others like the pufferfish can be so toxic that a human can die from eating one. Some flatfishes secrete toxins that seriously deter sharks and possibly other predators. Yet other fishes are venomous and can inject toxins with modified fins or spines. The stonefish is considered the world's most venomous fish and a sting can cause fatalities. Certainly many fishes, even small ones, can give a nasty bite. Avoid handling fishes. Fishy shapes: Fishes that live in the intertidal often have shapes that are adapted to the conditions there. In the intertidal, speed is not as vital as in the open ocean. While many fishes seen on our shores have the 'typical fish-shape', others have odd shapes. Some fishes are flattened sideways, like butterflyfishes and filefishes. This helps them slip into narrow places and they literally disappear when viewed from above water. Other fishes are flat like pancakes, like stingrays and flatfishes. Like living carpets, these can hunt for hidden morsels in the sand in shallow water, and to quickly bury themselves in the sand. Yet other fishes are long and snake-like. 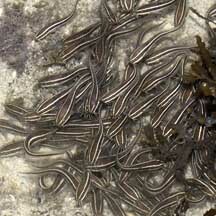 Eels and eel-like fishes can squirm into small places to hide and look for food. Many are small and almost transparent such as the perchlets also sometimes called glassfishes. Others are masters of camouflage and blend superbly with their surroundings. Fishes can take on many disguises. There are fishes that look like twigs (half beaks), plant roots (pipefishes), seaweed covered stones (scorpionfishes and frogfishes) or just simply an encrusted stone (stonefish). While many fishes hide in holes (toadfish) or in the sand (stargazer), the clown anemonefish finds safety among the stinging tentacles of a sea anemone! Fishy colours and patterns: Fishes come in a wide range of colours and patterns. Some bright colours warn of their distasteful nature. Colours are also used to attract mates. Bright colours may also help them blend into the psychedelic surroundings of the reefs. Fishes may have bars or other patterns to break up the body outline. 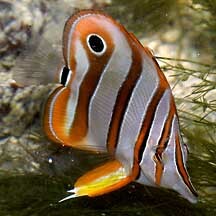 The butterflyfish has a large false eye to fool predators. What do they eat? As a group, fishes eat a wide variety of things, from plankton and detritus, to seaweeds and other animals. Many fishes specialise in particular prey. It appears fishes can track their prey by the tracks left in the water! What eats them? In turn, a great number of animals (including people) love to eat fish. Role in the habitat: Fishes are important to the health of the habitat. Fishes that graze on seaweed allow reefs to grow or recover from damage. Without these grazing fishes, the faster growing seaweed will overwhelm corals and other animals. Fishes that eat other animals also maintain the balance in the system, so that there isn't an overpopulation in their prey. Fishes that are eaten by other animals contribute to the food chain. Fish babies: Many reef fishes can change gender, but are usually only one gender at a time. In many fishes, a pair mates by releasing eggs and sperm simultaneously into the water. Some have complicated courtship rituals. Others such as seahorses may form long lasting monogamous pair bonds. Some fishes look after their eggs, some like seahorses and cardinalfishes even brood their eggs. 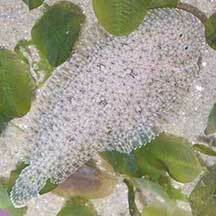 Most simply release their eggs into the water. Most fishes undergo metamorphosis and their larvae look nothing like their adults. The form that first hatches from the eggs may drift with the plankton. They eventually settle down and develop into miniatures of their parents. Human uses: Many fishes we seen on our shores are among our favourite seafood. Fishermen catch them with lines and nets. Driftnets are the most destructive way of catching fishes as they catch everything and not just the marketable ones. The unwanted fishes and other animals are wastefully thrown away. Other fishes are harvested for the aquarium trade. The harvest may involve the use of cyanide or blasting, which damage the habitat and kill many other creatures. Like other fish and creatures harvested from the wild, most die before they can reach the retailers. Without professional care, most die soon after they are sold. Often of starvation as owners are unable to provide the small creatures and plants that these fishes need to survive. In artificial conditions, many succumb to diseases and poor health. Those that do survive are unlikely to breed. Many of the fishes we commonly eat are being overfished, some to the point of extinction. These include the tuna in our favourite sushi dishes. Luxury fishes and fish products such as sharks fins and live grouper are being harvested in an unsustainable way. Others such as seahorses used in traditional chinese medicine are also globally overharvested. Be a discerning consumer and find out more about the fishes that you eat, how they are harvested or farmed. Adjust your consumption to minimise the impact to global fish stocks. Status and threats: Many of our shore and reef fishes are listed among the threatened animals of Singapore. They are threatened mainly by habitat loss due to reclamation or human activities along the coast that affect the water quality. Trampling by careless visitors and over-collection can also have an impact on local populations. The False clown anemonefish is more common on our shores than you might think. The seahorse is actually a fish! can hop around out of water! The Stonefish is the world's most venomous fish and is quite common on our shores. Seamoths are strange little fishes with 'wings'. in a ball for safety. Pretty butterflyfishes are sadly often harvested from the wild for the aquarium trade. 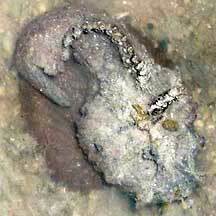 is sometimes seen on our reefs. The Longhorned cowfish is box-shaped! text index and photo index of fishes on this site. Fishing enthusiasts have netted some huge prizes in Singapore waters Whopper of a catch, Shuli Sudderuddin, Straits Times 15 Nov 09 on the wildsingapore news blog. FishBase technical fact sheets on families and individual species with photos and details on environment, climate, economic importance, resilience, distribution, biology, red list status, and more. Australian Museum Fish Site with find-a-fish section which links to factsheets with photos. Volume 3-6: Fishes edited by Kent E. Carpenter and Volker H. Niem FAO Species Identification Guide for Fishery Purposes: The Living Marine Resources of the Western Central Pacific on the Food and Agriculture Organization of the United Nations (FAO) website (pdf). Fishes of Libong Island (West Coast of Southern Thailand) by Keiichi Matsuura and Seishi Kimura (eds.) on the National Science Museum, Tokyo website: description of family with labelled diagram of key features and details on similar families found in the area, factsheets of species with photos. Fishes of Bitung (Northern Tip of Sulawesi Indonesia) by Seishi Kimura and Keiichi Matsuura (eds.) on the National Science Museum, Tokyo website: fact sheets with photos and descriptions with details on similar families found in the area. Coastal Fishes of Indonesia: Field Guide to Lombok Island by Keiichi Matsuura, Seishi Kimura and Teguh Peristiwady on the National Science Museum, Tokyo website: factsheets with photos and descriptions with details on similar families found in the area. Bond, Carl E., 1996. Biology of Fishes 2nd ed. Thomson Learning Inc., 750pp. Allen, Gerry, 2000. Marine Fishes of South-East Asia: A Field Guide for Anglers and Divers . Periplus Editions. 292 pp. Kuiter, Rudie H., 2000 (English edition). Seahorses, Pipefishes and their Relatives: A Comprehensive Guide to Syngnathiformes TMC Publishing, UK. 240 pp. Sparks, John, 1999. Battle of the Sexes in the Animal World BBC Worldwide, London. 224 pp.